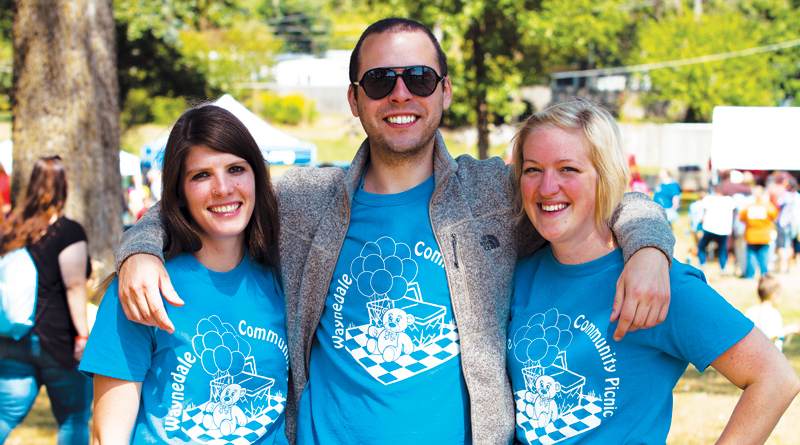 (l-r) Maria Sutherland, Alex Cornwell and Megan Ryan, of the Waynedale Community Picnic Committee pose after their 2017 event in Waynedale Park. 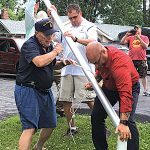 For as long as most people can remember, Waynedale has held a Memorial Day Parade, attracting over a thousand people to line Old Trail Road to celebrate and honor the holiday. Throughout the past 16 years, Waynedale has held the Waynedale Community Picnic which feeds free lunch and provides entertainment to over 2,000 guests for the day. And new this year, EMBARK, a community-wide celebration of sidewalks and trails on Bluffton Road is taking place. You may be saying to yourself, “Well yeah, just look at downtown, they hold larger and more frequent events than we have. What makes Waynedale events so special?” The answer to that question lies within the community members and businesses that make it happen. Waynedale has a unique culture of individuals, businesses and organizations who provide funding, prizes and volunteer time to make these and other community events possible. But, it may not be as well-known that these events aren’t funded by a grant or some form of government funding. Regardless, this doesn’t hold Waynedale back from attracting people from other communities or bringing our community together through these free events. To hold just one of these events, it takes hundreds of hours from dedicated individuals from within our community and thousands of dollars from local businesses. For example, this weekend’s community event EMBARK, which will be held on Saturday, July 21 from noon to 4pm, is free for anyone to participate and has been made possible by a committee of community members who have designed the event and collected donations from over 40 businesses in the area. An annual event, the Waynedale Community Picnic is coming next month on Saturday, August 25 from 10am to 3pm. Throughout the day of the event, the Picnic organizers coordinate about 40 volunteers. But previous to the event, the committee receives donations from over 100 businesses to support the day of fun. So, the next time you’re at an event in Waynedale, take a moment to reflect on how truly awesome it is to belong to a community that cares about bringing people together. Don’t forget to say “thanks for your time” to any volunteers you might see. And the next time you visit a local business that was on the event sponsor list, let them know how much it means to you that they supported an event that you enjoyed. Waynedale is a jewel in Fort Wayne, rich with unique opportunities that not everyone else can say they have in their community. Together a community makes positivity and great things happen.